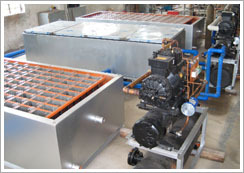 not energy cost effective.These factors lead to increased costs of production of ice blocks. The ice block machine of the present invention overcomes the aforementioned disadvantages. Our ice block machine has adopted the first-class refrigerant component of the world with the characteristics of high efficiency, energy saving and low noise. GC series ice block machine is a new highly-efficient machine aimed at meeting the ice needs of Africa and Oceania. It adopts an integrated design with easy installation and transportation. All the sizes are designed according to the International Container Standard. GC series ice block machines have the following types of ice blocks: 2.5 kg/PC, 5kg/PC, 6 kg/PC, 8kg/PC, 10kg/PC, 20kg/PC. 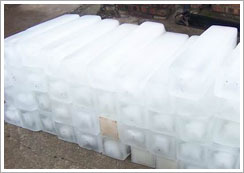 Meanwhile, we also can design the size of the ice block in compliance with the customers' requirements. We also provide different kinds for different purposes including large-size cube ice machine, flake ice machine, tube ice machine, marine ice machine and water cooling-packaged chiller. Copyright Notice © 2008 Biomass Renewable Energy Machinery All Rights Reserved.